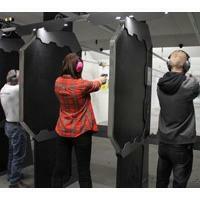 Experience the most incredible shooting range in Colorado… open to the public! We have superior training, a retail store, gunsmithing, party/event hosting, and much more. Magnum Shooting Center features 24 state-of-the-art pistol/rifle lanes and six 100-yard rifle lanes with the best in lighting and environmental control. Beyond this, the center features classrooms with the latest in Internet and video technology to enhance the learning experience. Magnum Shooting Center also offers the best in firearm repair – right on the premises – through the skilled gunsmithing services of renowned gunsmith, Todd Lockburner and his team. These skilled craftsmen have over 50 years of collective experience, and they know how to make your firearm sing, and fix any problem you may encounter. They also offer custom work to enhance your existing firearm or create a totally personalized firearm to your exact specifications. We are open to the public, but also offer an affordable membership program that gives a significant number of benefits (including priority lane use) for those who choose to become members. In addition to Individual Memberships, we also offer Couple Memberships, Family Memberships, and Corporate Memberships. We’re proud to bring the first Magnum Shooting Center to Colorado. We’d like to invite you to become a member… or sign up to receive special offers, promotions, and other exciting information.